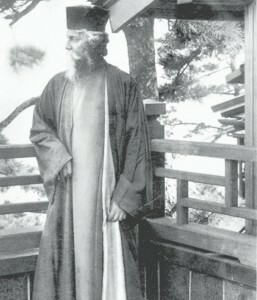 In 1930, Romain Rolland, who, like many of Rabindranath Tagore’s friends, loved him deeply yet was often disappointed in him, wrote in his diary, “Perpetual travelling has become for Tagore a sickly need…” Rolland had many excuses for Tagore, but four years earlier, fearing that plans for another meeting with the poet would come to nothing, Rolland had put down in his diary at far greater length a penetrating analysis: “His nature is eternally divided between his poetic aspirations, which are the deepest, and the prophetic social role that the circumstances forced him to adopt… In his avid and childish desire to travel everywhere in Europe, Tagore, who is not wealthy any more, has surrendered himself to an agent organising paying lectures for him.” As Rolland noted elsewhere, as did other friends, the money was for Visva-Bharati, the idea of which enthused Rolland so deeply that he had wished to come and see it. Tagore’s longing for other countries, other horizons, or even for an undefined, limitless distance, was certainly avid. It was expressed in a range of moods, from a dreamy spell-binding thirst for the limitless distance to the hot-blooded yearning for a transformation into an “Arab Bedouin” thundering over the pathless desert on his horse. The imagination of the unknown could be both childlike and poetic, and it is peculiarly fitting that The Post Office , his play in which the sickly Amal sits at his window imagining winding roads, unseen streams and the land on the other side of the hill, should be one of his most widely translated non-poetic works that has been performed repeatedly overseas. But he was childishly restless too, as Rolland suggests, confessing to an ungovernable itch to take off to other lands after fairly brief intervals. In many of his poems, his desire to travel merges with a passionate need to devour all the experience that this earth offers him, including the ever-changing aspects of nature. Tagore did travel far and wide, and receiving the Nobel prize in 1913 made him a welcome and honoured guest in numerous countries. However childlike or passionate his imagination, he was far from a simple presence, and his message far from compliant. The complicated responses he provoked in each country, the uneven histories of his legacies in different parts of the world, the friends he collected and the critics he incited – friends and admirers could become critics too – are the subject of Rabindranath Tagore: One Hundred Years of Global Reception . It is an exhaustive compilation of the history of Tagore’s reception in the countries he visited, and the writers are specialists in touch with Tagore’s work as part of their research, teaching or translation. That one volume on the poet’s impact in other countries should bring together almost 40 scholars of different nationalities trained in different disciplines and languages and working in different parts of the world would probably have pleased the traveller greatly, even if the substance is not always complimentary. Rather, the story that glimmers through the information-laden 671 pages is one of slow and difficult achievement, a troubled, sometimes sparse, but meaningful exchange of ideas, poetry and understanding, and the power that a poet’s presence had to excite deep feelings that each country’s history made unique in every case. Rolland speaks of Europe alone, but Tagore was hungry for the whole world, East, West and in between. The volume, therefore, is divided into five parts, beginning with East and South Asia, through Middle East and Africa, to two sections on Europe, one on his travels in Eastern and Central Europe, and the other in Northern and Western Europe. The six chapters in the fifth part discuss his impact in the Americas, in Brazil, Argentina, Costa Rica, Mexico, the United States of America and Canada. He went to many places more than once, which complicates the nature of his legacies, and was often an invited guest in countries hostile to one another, so that the same poems could acquire different meanings in the context of conflicting attitudes. Then again, there were shades of difference within similar cultures. The enthusiasm with which Tagore was greeted in Egypt, for example, must be seen in the context of the broader Arabic response. While Egyptian poets, thinkers and intellectuals responded to his humanism and compared his spiritual thinking to the Sufi idea of the unity of existence, Arabic writings ignored his awareness of science and his concern for the lot of women. The drama of transaction was particularly keen in certain countries. The China and Japan visits, for example, were rich in a mixed harvest for both sides. Although Tagore did not make the kind of error on the first visits there as he did in the cases of Italy or Russia, what he said was not always welcome. Preceding him were translations of some of his work, exciting and engaging poets, critics and translators – Gitanjali , of course, and The Crescent Moon, Fruit-Gathering , The Gardener, with their unfamiliar magic, and Sadhana . More would soon follow in the countries that were interested, translations of poetry, plays and fiction; in China, Tagore enjoyed a production of Chitra on his 63rd birthday. Rolland is perhaps over-sensitive because, as he says himself, he loved the poet “tenderly”. But it has to be asked how far this perception is a factor in the critical or caustic responses of, say, Borges or Lukács, or in an examination of the reasons behind the fall in interest among initial enthusiasts like André Gide, for example. Yet the stream of accomplished visitors, teachers, artists and researchers from all over the world to Visva-Bharati never flags, and translations continue in different corners of the world, showing how intricate, even mysterious, intense cultural exchanges can be.